Galerie Ferdinand Möller, Berlin and Cologne. Georg von der Vring, Munich, by 1956. Acquired by the present owner in 1988. W. Grohmann, Karl Schmidt-Rottluff, Stuttgart, 1956, p. 286 (illustrated p. 258; titled 'Rote Gladiolen auf blauem Grund'). 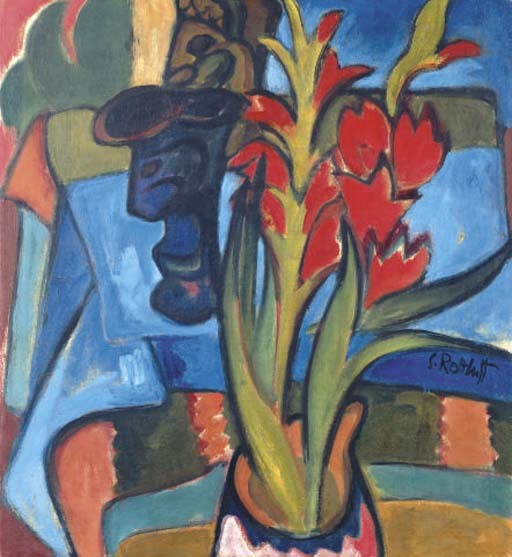 Stilleben mit roten Blüten, was painted in 1913, when Schmidt-Rottluff was at the very height of his career. It was during the Summer of that year that Schmidt-Rottluff spent June to August in Nidden with Max Pechstein, marking the beginning of a period of intense creativity. His paintings of this period mark a new departure in his art, distinguished by the heavy influence of African sculpture on his work, as illustrated in this painting. Submitting to a bold and universal reduction of form and detail to the barest of essentials, each shape in Schmidt-Rottluff's paintings became simplified into a harsh, angular and almost cubist simplicity of form, which echoes the highly reductive nature and sharp angularity of African tribal carving. This can be best seen in the vibrant and angular depiction of the sharped tipped flowers and leaves of the gladiolae in Stilleben mit roten Blüten. On the table behind stand examples of two of the African figurative sculptures which had such a strong influence on Schmidt-Rottluff and the other members of the Brücke artists. The Brücke artists' belief in authentic, unmediated handcrafts fostered their interest in African sculpture and masks, which they understood as direct and spontaneously created objects. Whilst access to such objects was limited, the ethnographic museums in Dresden, Berlin and Hamburg all had collections of tribal art and became an integral part of the working lives of the Brücke artists. Pechstein, with whom Schmidt-Rottluff painted, in 1913 wrote in his diary about trips to the museums' primitive displays. He also, like Schmidt-Rottluff, collected African sculpture himself. Similar, if not the same carvings as depicted in the present painting, can be seen in a smaller canvas, Stilleben mit Neger-plastik, from 1913, hanging in the Museum Ludwig in Cologne.